8:15 AM Woke up after tossing and turning all night long. It is hard to sleep when your body is used to being awake. 10:00 Sgt. Millen, Joe’s co-worker picked us up this morning and took us all over the base to get our paperwork in order. Updated ID cards, housing office, Tricare office, even a trip to Camp Humphreys, it was a long but efficient day. Today, Songtan had beautiful skies but a nice chilly 32 degrees F.
4:30 PM Joe and I returned to Turumi Lodge to change and took a walk down to Shinjang-dong, the shopping district just outside the main gate. We found some great Korean about a block from the main gate. It was called Blue Opera and the whole restaurant is couches and big chairs with tables. The food was great, although we don’t have much to compare it to yet. We did, however, think it was a bit weird that they served our Yaki-mandu (Korean fried dumplings) with a side of french fries and ketchup. I guess that’s what you get for eating outside an American Air Force Base. 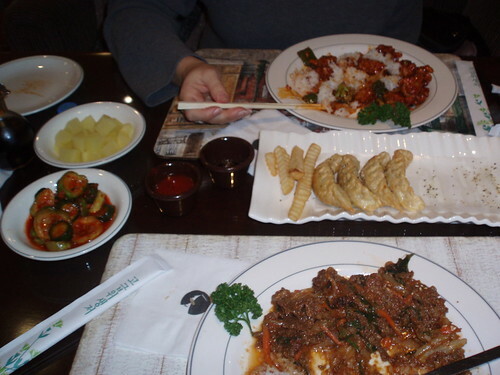 Our first meal, I got Chicken Kkanpungi and Joe had Beef Bulgogi. We also got cucumber and pickled radish. I thought it was pineapple but it’s not. French fries and Yaki-mandu, weird huh? 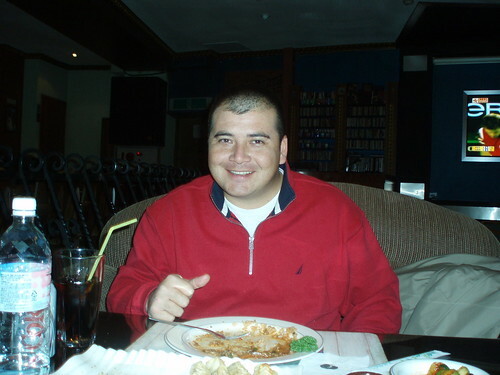 Joe, enjoying his first Korean meal in Songtan. Does he look happy or what? This is us outside the main gate right in front of Shinjang-dong shopping district. I am in heaven here, so many purses, shoes and accessories. 5:30 PM After dinner and a stroll down Shinjang-dong we were picked up by Miss Sue, a realtor Joe’s Captain recommended to us. She took us to two possible apartments, neither of which we really loved and then dropped us back at the base.